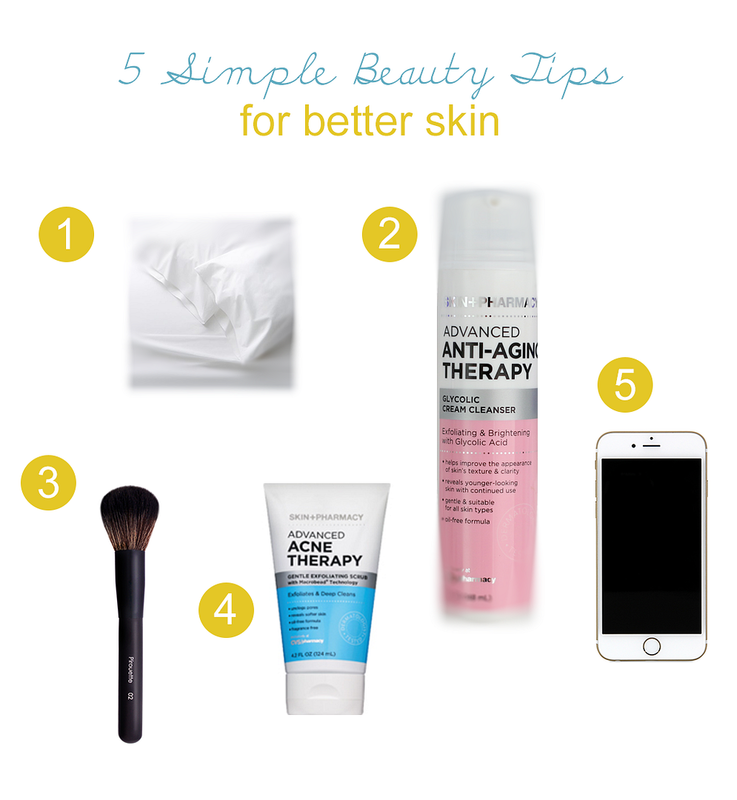 Maintaining healthy skin is sometimes easier said than done so today I am sharing 5 simple tips that can help keep your skin looking its best. 1. Change your pillowcase more often. This is always the first instruction I give my clients after a facial treatment. When your skin has been deeply exfoliated either at a spa or using Glycolic Peel Pads (a new addition to my skincare routine!) you are more susceptible to bacteria. So my rule of thumb is to change your pillowcase at least twice a week. During sleep, you sweat, drool, and toss around, resulting in the collection of dead skin cells on your pillowcase. If you keep placing your face on the same pillowcase night after night without changing it more often, you may be causing unnecessary breakouts. 2. Do not over cleanse your face. Cleansing your face more than twice a day can strip your skin of its natural oils and can actually cause your skin to produce more oil. Even if you are prone to breakouts, or have super oily skin you should still only wash your face with a cleanser morning and night. A great gentle cleaner is the Skin+Pharmacy Glycolic Cream Cleanser. It helps reveal younger looking skin with continued use (without over drying!) and is suitable for all skin types. 3. Clean your makeup brushes. I recommend cleaning your makeup brushes at least once a month. Otherwise, they become a breeding ground for bacteria. 4. Exfoliate twice a week. Exfoliating your skin twice a week will not only give you a crucial deep cleanse but it will also help eliminate clogged pores and dry/rough patches. If you are looking for a gentle and effective exfoliator, I recommend the Skin+Pharmacy Gentle Exfoliating Scrub, which will leave your skin feeling so clean and fresh afterwards. A few things to keep in mind when exfoliating are: a dime size is all you need, always exfoliate at night, use gentle upward motions and follow up with a moisturizer and eye cream. A wonderful nightly eye cream that I recommend is the Skin+Pharmacy Anti-Aging Therapy Retinol Eye Cream, which helps reduce fine lines, wrinkles, and dark circles. I use a tiny bit and gently pat until it is fully absorbed. 5. Clean your cell phone daily. Contact acne from objects is very common and can easily be avoided by simply wiping your cell phone screen with a very damp, clean cloth. If you do happen to get a breakout, an excellent product to treat the blemish with is the Skin+Pharmacy Acne Therapy Spot Treatment. It's formulated with benzoyl peroxide to kill acne-causing bacteria. And there you have it! If you have any questions regarding these tips, you can leave them in the comment section and I will be happy to answer. Skin+Pharmacy is exclusively available at CVS, so if you're interested in testing out any of the products listed above, make sure you sign up for CVS Beauty Club. Members receive $5 extra bucks after every $50 spent on beauty products, so if you decide to try out these products, you'll be well on your way to getting rewarded! * This post is in partnership with CVS pharmacy. All opinions are my own. Thank you for supporting the brands that help support this blog. Karis- Thank you! And depending on what your specific skin care needs are, I recommend using a mask 1-2x per week. Great tips about changing your pillow case and cleaning your cell phone! Can you share your brush cleaning recipe? Question for you: any recommendations for naturally balancing hormones post-partum? I've read that Evening Primrose Oil is good? My skin has been rebelling for months and I'm currently dealing with some really lovely cystic acne on my jawline. ugh. Thanks for the tips! I definitely need them, haha! Awesome post, great ideas for little changes that make a big impact! Is glycol acid safe to use during pregnancy? Miss Rabbitt - It is best to avoid glycolic acid during pregnancy and while breastfeeding. YES for cleaning your phone! So happy you mentioned this one. It really is gross the amount of crap that can come off of that. Thanks for these tips! I've heard good things about this line. Great post! I need to remember to exfoliate. Any good diy ones I can make? I like your work every time. My personal favorite is Kiehl's cleanser and Dermology anti aging solution for signs of aging.